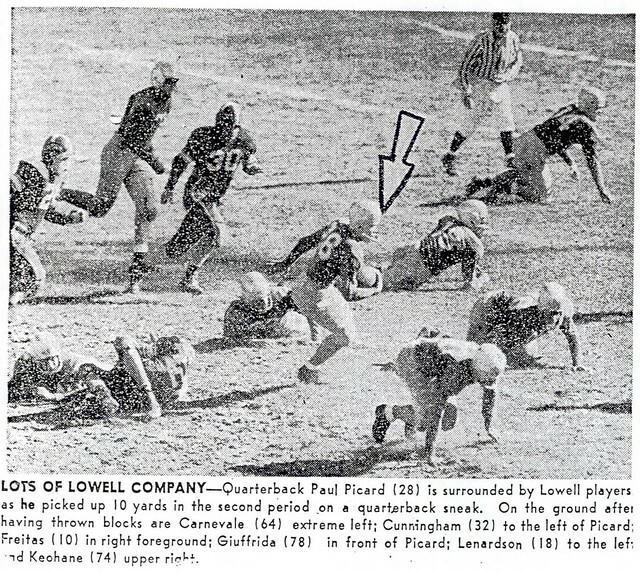 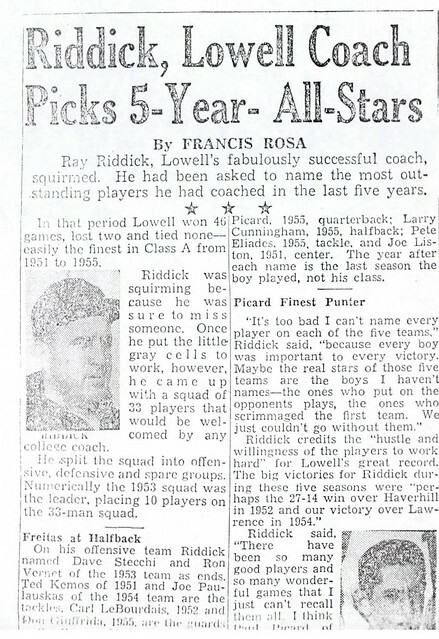 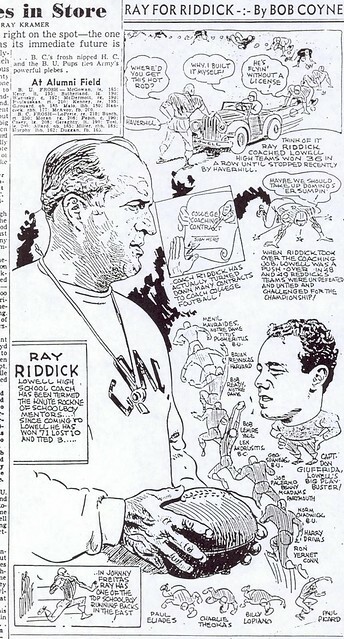 A true triple threat performer, Paul Picard was one of the standout quarterbacks for Lowell High School during the glory days of legendary Hall of Fame Coach Ray Riddick. 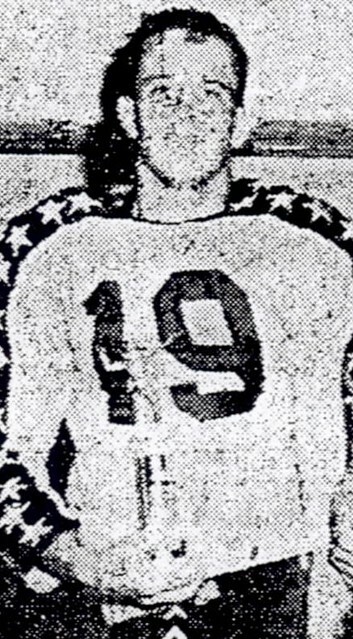 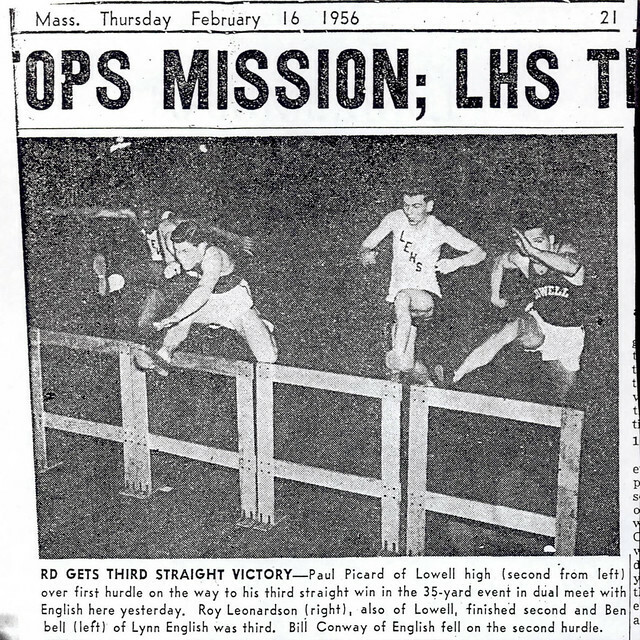 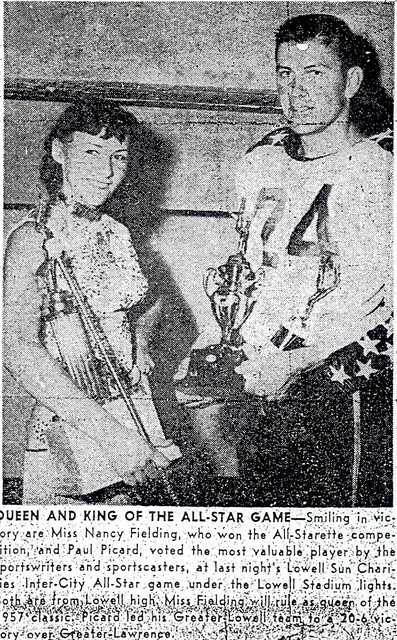 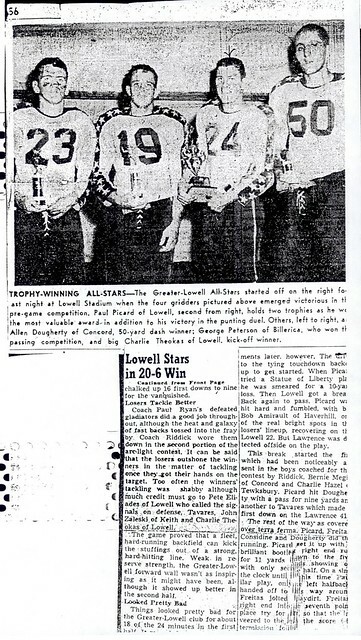 During Paul’s two years as the starting signal caller for the Raiders, Paul led the team to a 17–1 record, including an undefeated 9–0 run as Lowell won the State Championship during the 1954 campaign. 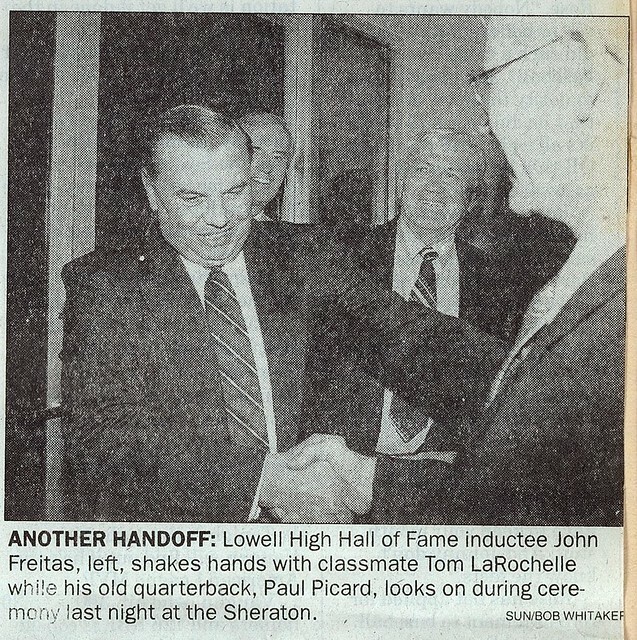 Paul was a gifted runner and passer. 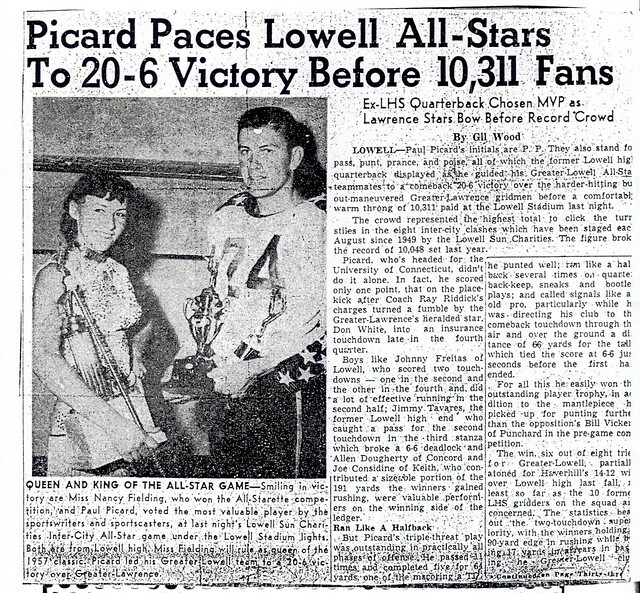 During an era when Lowell’s success was primarily due to its dominating ground attack, Paul managed to compile impressive statistics through the air. 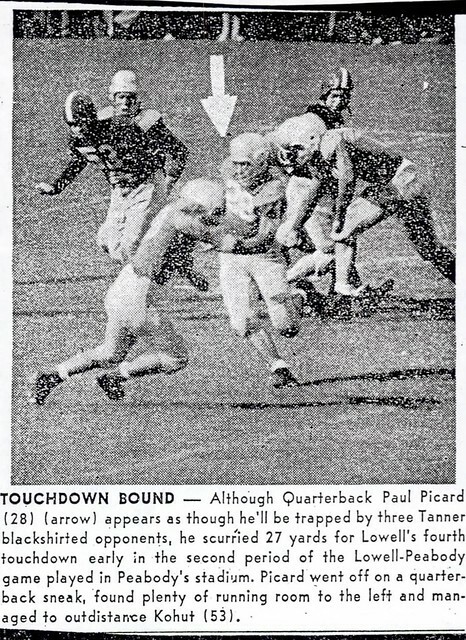 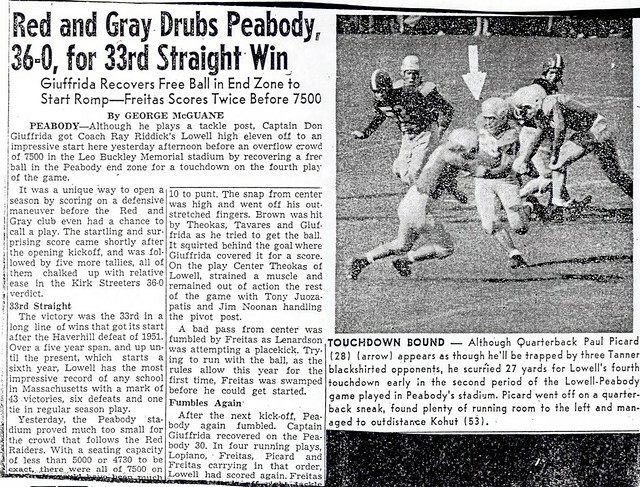 During the State Championship season (1954), Paul threw for 628 yards and 5 touchdowns, including a 72-yard aerial to Don Overlock. 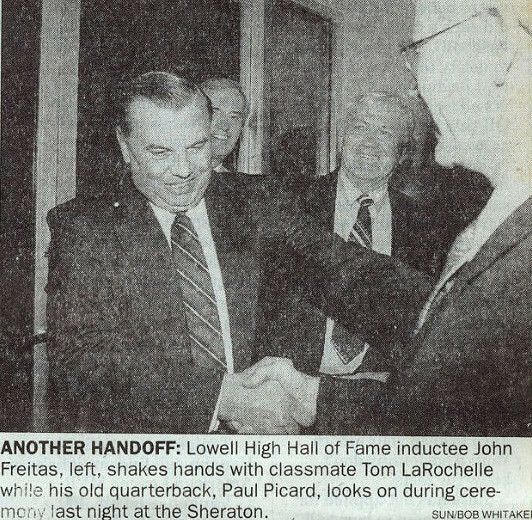 For his career, Paul amassed 1,172 yards passing (6th on the all-time Lowell list). 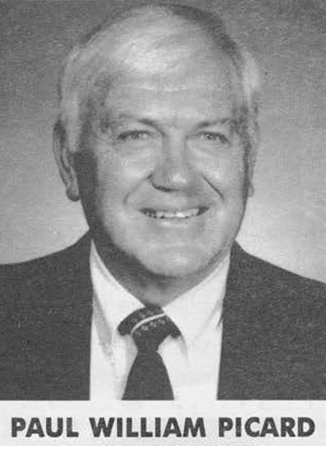 He set a single season school record for passing percentage (60.4%) in 1955 and a career record of 53.8%–marks that still stand today some 50 years later. 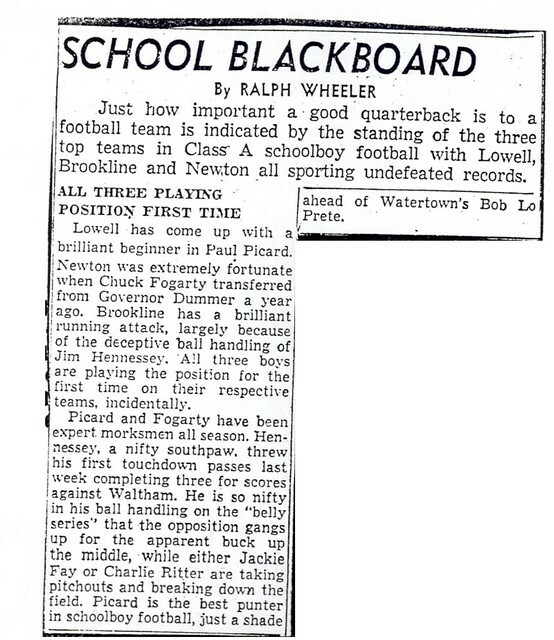 One of the outstanding punters in Lowell High School history, Paul was tabbed by at least one Boston newspaper columnist as the state’s premier punter. 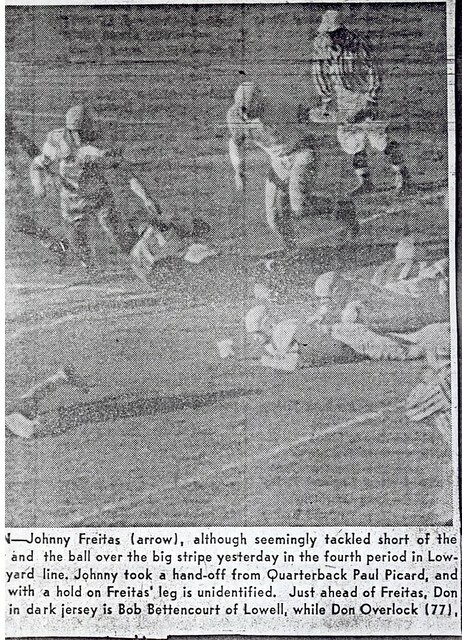 His career best of 65 yards certainly did nothing to dispel that opinion. 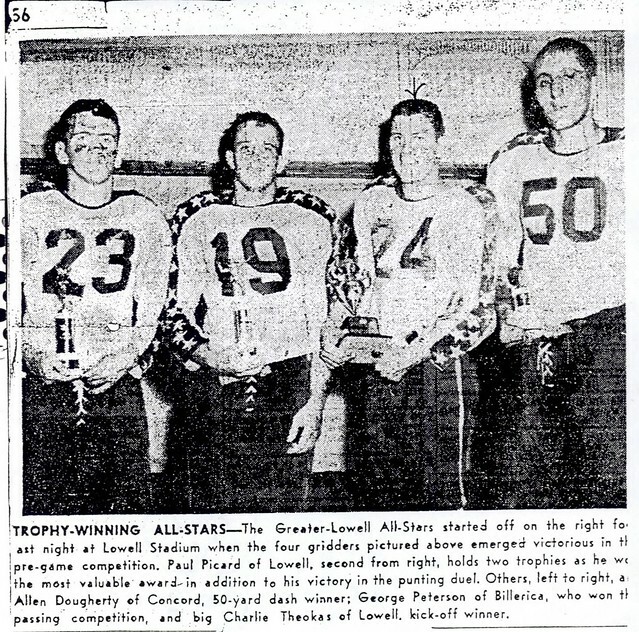 Paul completed his Raider gridiron career in grand style at the annual Greater-Lowell vs. Greater-Lawrence All-Star Classic, winning the pre-game punting contest and then being named the game’s MVP as he led Greater­Lowell to a 20–6 victory before more than 10,000 fans at Cawley Stadium. 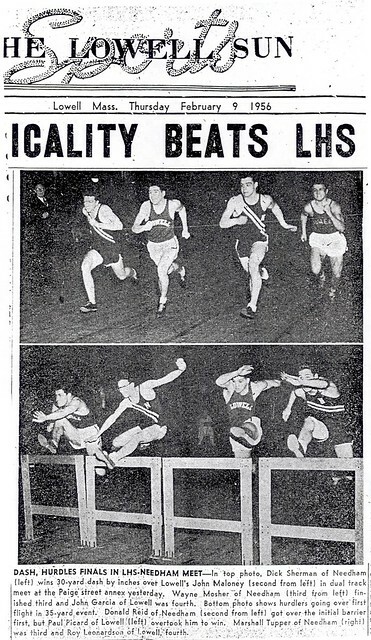 In addition to his grid exploits, Paul was a standout high hurdler for Hall of Fame Track Coach George “Mike” Haggerty, completing the 1955-56 season undefeated for the Red and Gray. 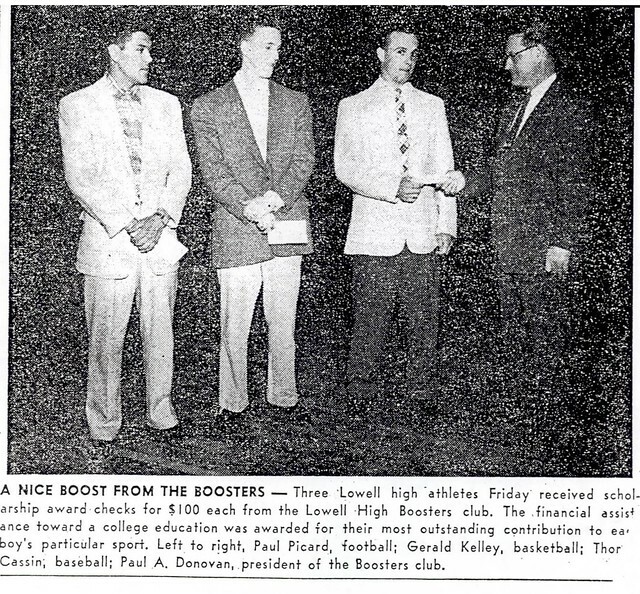 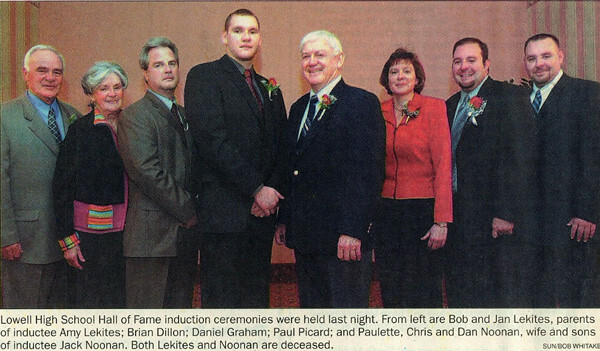 Paul joins several LHS teammates in the Hall of Fame, including 1956 classmates John Freitas and Don Giuffrida and Walter “Herky” McGrade, John Maloney, and another of tonight’s inductees, Jack Noonan, all from the class of 1957.